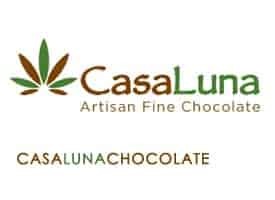 CBD Oil Review rates the Casa Luna Chocolate line with one star because it qualifies for the Innovation Badge. Casa Luna Chocolate is one of the first and most popular CBD oil chocolate bars on the market that range in price from $16-$26. Casa Luna CBD chocolate bars are made with 100% organic and kosher certified ingredients. Casa Luna’s chocolate is what’s considered ‘bean to bar’ which means, short of growing the cacao, that they made it from scratch. Casa Luna appears to be chocolate makers first as this is most of what they discuss on their website. 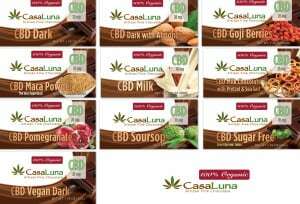 Innovation Verified – Casa Luna CBD chocolate bars are a complete line specializing in CBD chocolate and one of few on the market. Quality is Questionable – Casa Luna speaks only about the quality of their chocolate and not the CBD oil, this raises questions. Might Not Be Safe – Because they do not publish lab tests it is impossible to know if the CBD oil used is safe or not. Lacking Details – If you check out Casa Luna’s site you’ll notice that there is not much information there, this makes it hard to trust their offerings.